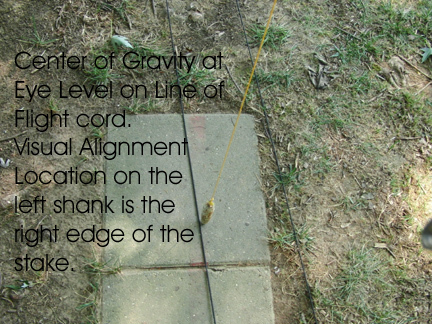 This is a continuation of the discussion of the “High Point” and the “Release Point”. 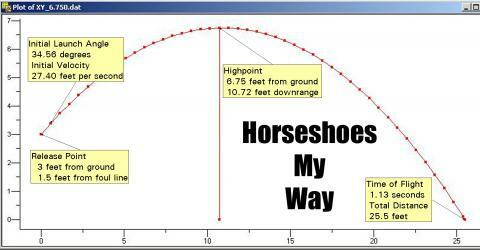 Originally, I wanted Part 30 to be a description of my personal technique for flipping a horseshoe from 30 feet. 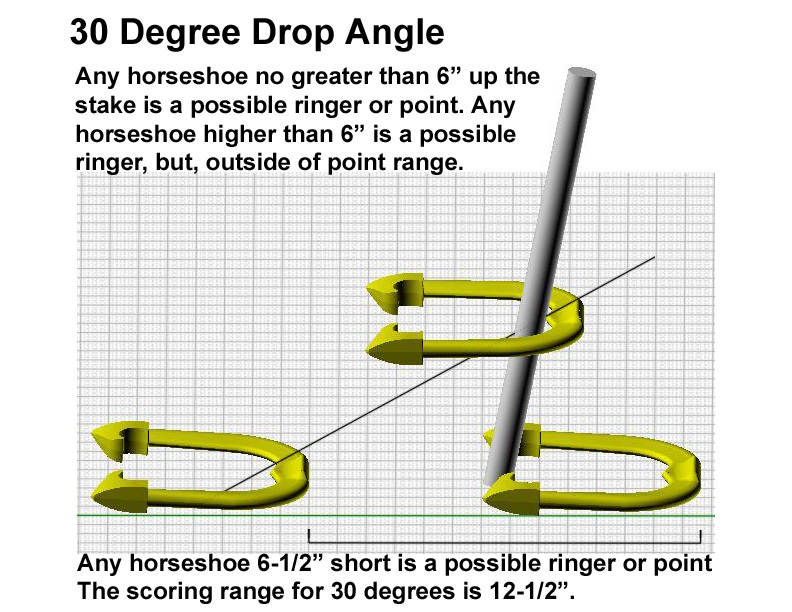 However, I felt I needed to describe the importance of the “Drop Angle”, whether pitching in sand or clay. 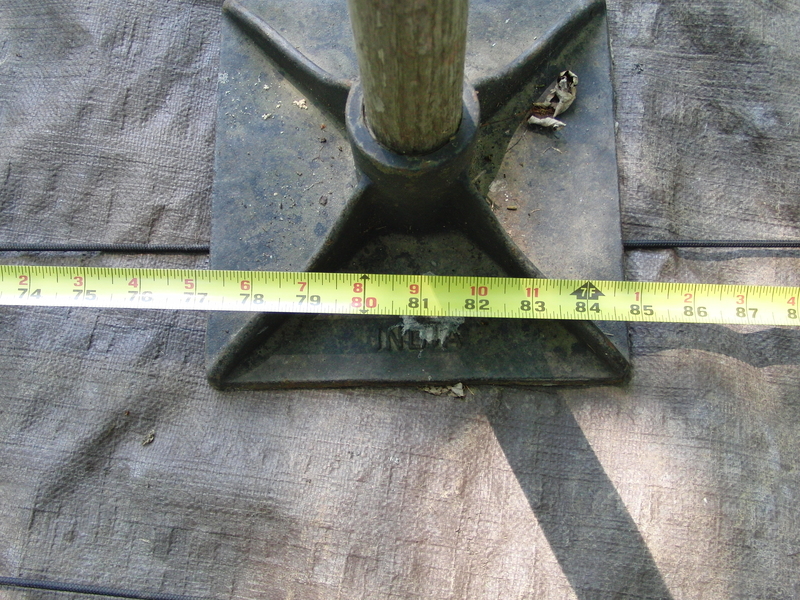 The image above represents the scoring area around the stake. Any part of a horseshoe inside of the scoring area is a potential point in a cancellation match. 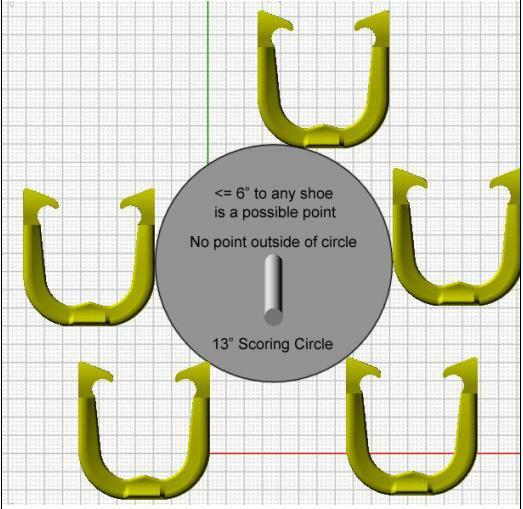 In a count all points match, any part of a horseshoe inside of the scoring circle “is” a point. The image above represents the minimum drop angle of 30 degrees. The shoe bottom right shows a ringer that is 6-1/2″ short of the ringer break. The middle shoe arrives 6″ above the ground, a potential ringer. 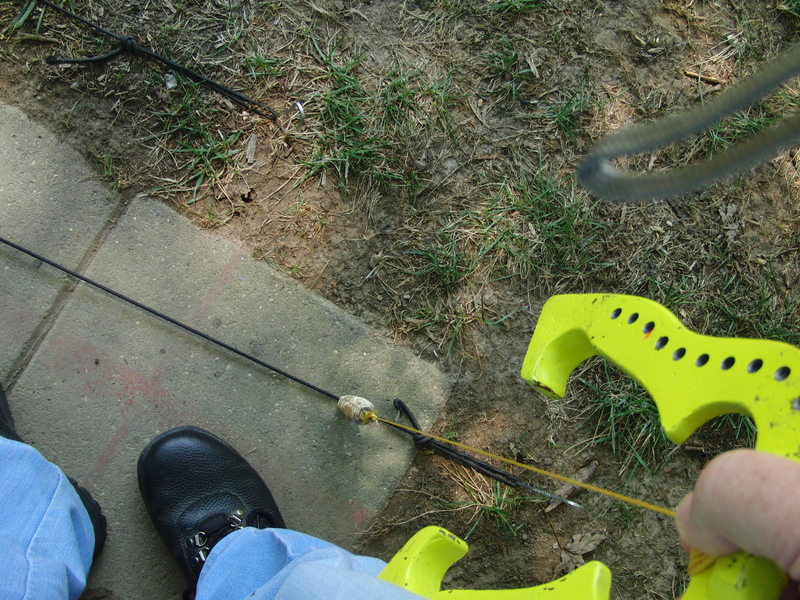 The shoe on the left is a potential point when the shoe is not a ringer, but, passes the stake no higher than 6″ above the ground. This drop angle gives me a 12-1/2″ ringer length. 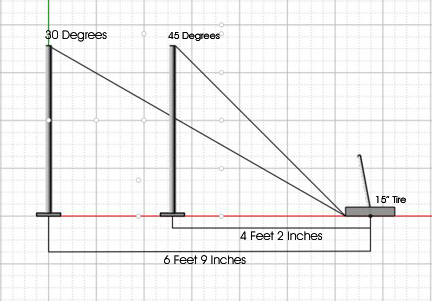 Here is the representation of a 45 degree drop angle. 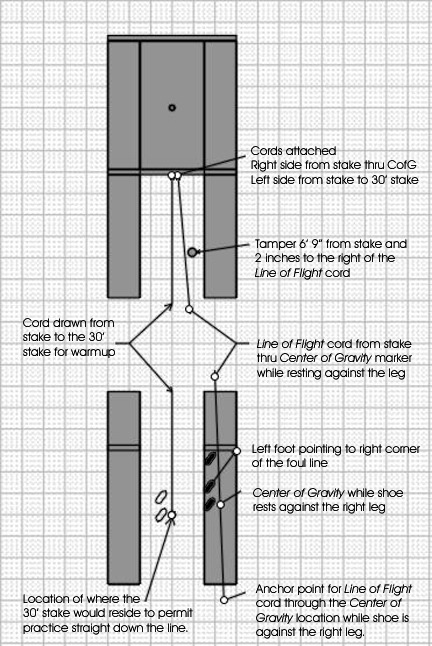 Notice that a non-ringer passing the stake at 6″ results in a shoe that is more likely to salvage a point over a 30 degree drop angle. 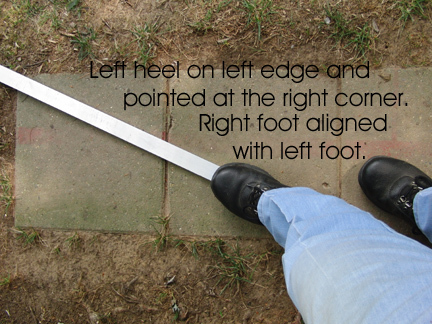 Your own personal drop angle is more than likely dictated by the rotation of your flipped shoe. 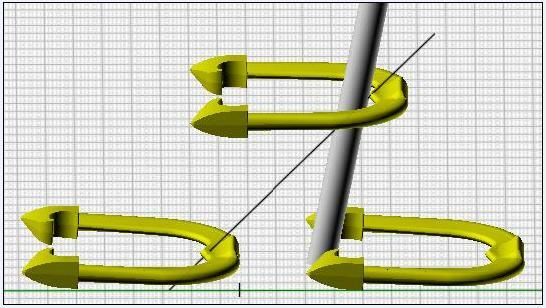 The greater the drop angle the slower the shoe needs to rotate, the higher the launch angle and the later the release. In Part 31 I will discuss a simple way that I use to alter my drop angle during practice. It is important that I keep my drop angle somewhere between 30 and 45 degrees. When I pitch in my sand league, I concentrate on launching the shoe higher with slower flip rotation to pick up those all important points if I miss a ringer. 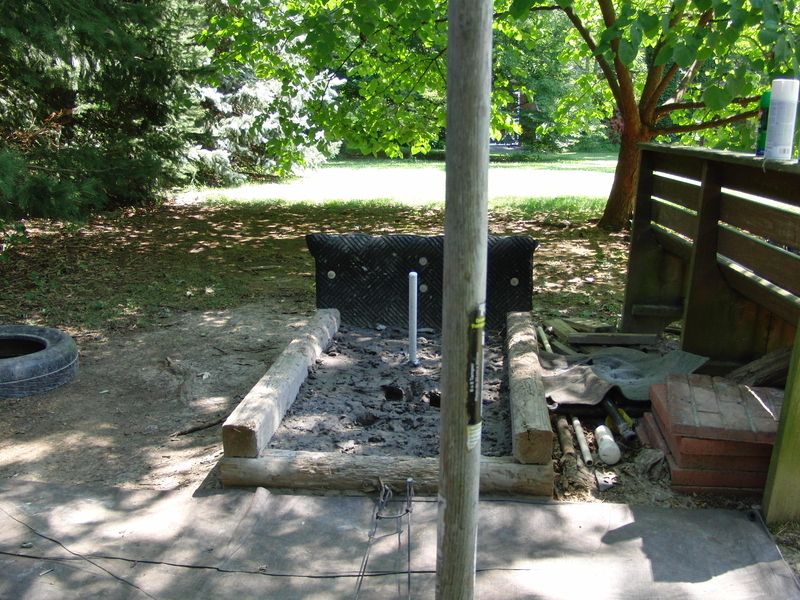 I have found that surrounding the stake with a 15″ tire helps me get the feel for point control. Using the tire is in addition to the simple method of controlling my drop angle during practice. Continue to Part 31 for a description of my current pitching method.